While Apple Inc may be gaining plaudits for the audio quality of its new HomePod speakers, some users with wooden furniture are finding themselves less than thrilled with their new purchase, due to a surprising issue that has cropped up. Numerous reports have surfaced online from disgruntled Apple customers that the HomePod's silicone base is leaving pale rings when placed on wooden surfaces. Though tests by Bloomberg News failed to replicate the issue, nor does it seem to be replicable with other materials such as glass, several other websites have backed up the wood discolouration claims. Acknowledgements: Picture (c) Apple, Inc.
Britain’s main cyber security agency on Friday warned British government agencies to avoid using anti-virus software from Russian companies, the latest in a series of moves targeting Moscow-based security software maker Kaspersky Lab. Box image courtesy Kaspersky’s web site. Kaspersky Labs is a multinational corporation that provides cybersecurity services worldwide. The company does a lot of work in identifying threats to computers, the internet and governments that could damage computers or lead to information getting out that shouldn't be made public; and helps to find solutions. As well as internet security, password management and many other security tools, one of the products Kaspersky is most well-known for developing and selling is its own Antivirus product, Kaspersky Anti-Virus (and also Kaspersky Internet Security), which is used by governments and individuals alike to help protect computers from being compromised or damaged by malicious attacks. Kaspersky Labs is headquartered in Moscow, Russia – a country known to have strict laws over control of data in and out of its borders. Russia lately has been in a lot of hot water with the United States over longstanding allegations that the country attempted to rig the 2016 Presidential Election and has too close ties to current president Donald Trump; and may be secretly attempting to influence America. The United States have expressed concerns that Kaspersky have "close ties to intelligence agencies in Moscow and that its software could be used to enable Russian spying". In response, Kaspersky has offered to share source code showing how parts of their software works, in order to supposedly prove that Kaspersky does not hand any data over to Russia. This hasn't alleviated the US Government's concerns, however, and Kaspersky’s anti-virus software was banned from US government networks earlier this year. Now, the UK has decided to follow suit. In the United Kingdom, the government organisation responsible for computer security is the UK National Cyber Security Centre. On Friday, its director, Ciaran Martin, penned a letter to departmental permanent secretaries asking them to stop using Kaspersky software, saying that Russian-made software should "not be used in systems containing information that would harm national security if it was accessed by the Russian government." The wording of the letter makes clear that the UK agrees with the US that there are significant concerns that Kaspersky software could be leaking data to Russian governments that would be dangerous if it got out. Martin added that his agency is "in talks with Kaspersky Lab to develop a system for reviewing its products for use in Britain." Kaspersky Labs allege their organisation has become a scapegoat in the midst of the rising tensions between America and Russia; and say that it looked forward to working with the NCSC on the issue in a statement released following the NCSC announcement. At this point in time, there is no real proof that Kaspersky DOES send data that passes through its systems on to the Russian government; or what that data entails. However, the fact the company does dealings with government, corporate and military organisations worldwide, and is itself based in Moscow, makes the possibility impossible to ignore. The NCSC's statement only refers to matters of "national security", saying that Kaspersky software should only be avoided if the possibility of Russians getting ahold of it "poses a significant risk". For most at-home users, therefore, there is nothing to worry about. However, if you are a user of Kaspersky Antivirus, Internet Security or any of their other products; and you find the revelations discomforting or are concerned for your privacy, it may well be worth looking into alternative products just for your own peace of mind. The humble coffee table. One of the most recognised pieces of furniture there is. Everyone's living room has one, I'd wager; and whether it's used to put your coffee and biscuits as you watch TV; as a decorative item; or as something to put your paperwork and other junk on, it's fair to say that they're not the most inspiring parts of a room or the most useful. Now, a New York-based firm called StoreBound thinks it's time the coffee table got a 21st-Century upgrade. "Designed for a digital lifestyle… the furniture of the future." Thus starts the IndieGoGo pitch for Sobro, a smart coffee table designed to support your connected lifestyle, which at the time of writing has already thrashed its modest $50,000 funding goal, raising $838,055 at the time of writing with a month of the campaign still to run. "We've elevated the coffee table from a piece of wood that props up unopened large-format books, to an all-in-one center that connects your powered up life." 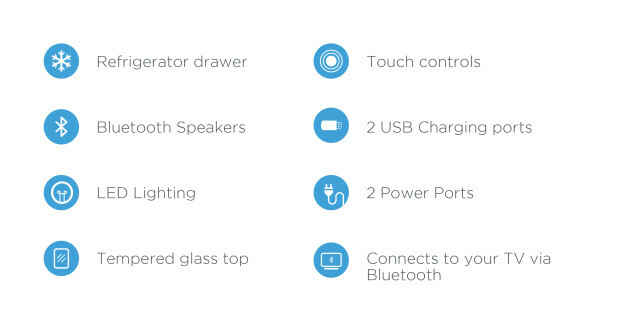 A list of the features offered by a Sobro coffee table. 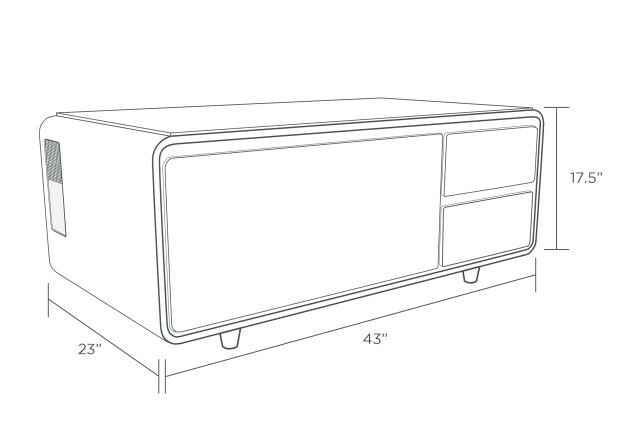 At its heart, Sobro is a coffee table with an integrated refrigerator drawer, designed to allow you to keep beverages chilled and snacks fresh while still allowing you to use it as an actual surface like a regular table. There are also two side drawers, for storing items that don't need to be chilled. The top surface of this chunky furniture item is tempered glass, which StoreBound claims is durable and easy to clean, making coasters a thing of the past. But Sobro is more than just a glass-covered work-top with a fridge – this is a true techy delight. To the left and right sides, the Sobro is equipped with dual Bluetooth-connected speakers, allowing you to pump music into the room from any Bluetooth-connected device with a rich bass and high-quality sound. This can be combined with configurable LED lighting on the underside of the Sobro in order to create a real sense of atmosphere, or bring life to a party. Speaking of configuration, the bottom-right side of the Sobro's top surface features touch-sensitive controls, through which one can control the Sobro's audio, lights and drawer temperature; and its Bluetooth connections right from the tabletop – no need for a smartphone and companion app. Speaking of which, do you find that your smartphone or tablet runs out of juice far too quickly? The Sobro has you covered. With two USB ports on its side, the Sobro can charge two USB-powered devices at the same time. The Sobro also contains two standard power outlets, so even traditional electronics can be plugged in – why not keep your laptop plugged in while you use it? The Sobro gets all its power from a single plug which can be plugged into a wall socket and concealed underneath, allowing you to split a single socket into four separate power solutions. StoreBound claim the Sobro’s dimensions and stylish appearance will allow it to fit in wherever you might normally find a coffee table. Unfortunately, because the Sobro uses 110-Volt American-style outlets, the Sobro is currently only planned to ship to America and Canada. This restriction, however, doesn't seem to have hampered the product's reach, with the connected coffee table being backed by almost 1200 IndieGoGo users at the time of writing. Currently, a pledge of $649 or more will buy you one Sobro, but slots are already filling up and once 200 people have claimed this perk, the price will rise to $899 for everyone else. Even this, however is still a 40% saving on the product's expected retail price of $1499 – so if the sound of a connected coffee table appeals to you, and you live in the USA or Canada, don't miss your chance!